I am pleased to once again join forces with First Spouse all across the United States and Family Day to celebrate the simple, everyday things parents do to connect with their kids. Founded in 2001 by Center on Addiction, Family Day works with organizations across the country to educate parents about how everyday activities create strong, healthy relationships that can prevent future substance use. Did you know that addiction is a disease that in most cases begins in adolescence? Adolescence is the critical period for the initiation of risky drug use and its consequences. Nine out of 10 Americans who meet the medical criteria for addiction started smoking, drinking, or using other drugs before age 18. Preventing or delaying teens from using addictive substances for as long as possible is crucial to their health and safety. Every year that initiation of drug use is delayed, the risk of addiction goes down. The State of Texas is committed to strengthening familes. Celebrating #CASAFamilyDay and spreading this important message is a positive step in helping keep America's children and teens drug-free. Parents, YOU make the difference! Get involved and learn more about what you can do to build a strong, healthy relationship with your kids that prevents future drug use. It’s as easy as sharing a meal, playing a game, or asking about your kids’ day. These may seem small, but even the little things can make a difference in the life of a child. 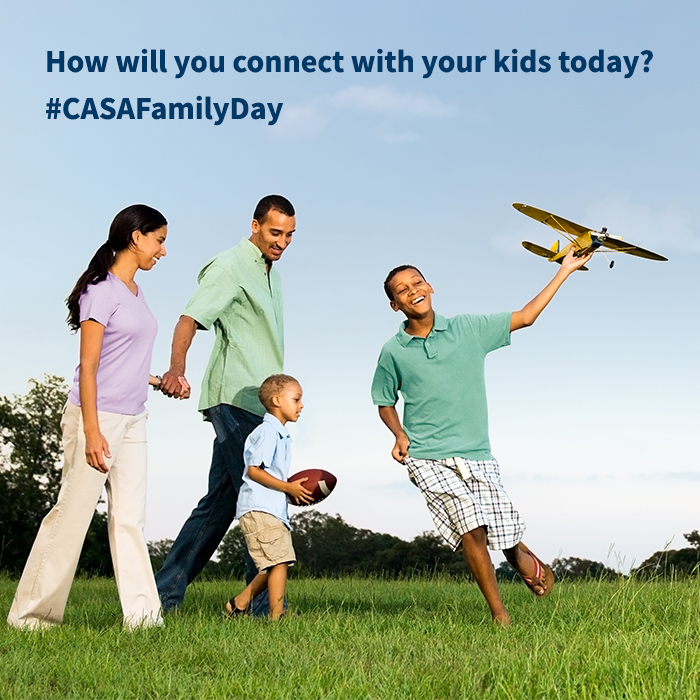 For additional information about Family Day, visit http://www.casafamilyday.org/. You can also find Family Day on Facebook and Twitter. How will you connect with your kids today?